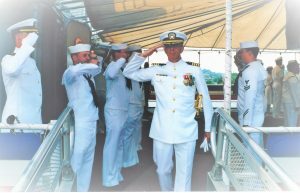 Hero’s Bridge volunteer Bruce Campbell is a retired Captain USNR and has been actively involved in both the Battle Buddy and Honor Guard programs. Bruce served in the Navy from June 1970 to July 2000, and was the recipient of multiple awards (see image for complete listing), including two Meritorious Service Medals and three Navy Commendation Medals. In the 1960s, Bruce said it was common for high school students to expect to serve; either planned or through the draft. “Most of us had expectations to serve because fathers and other relatives served in World War II,” he said. Bruce served in the Vietnam War from 1970 through 1972 aboard the destroyer USS Rowan (DD-782)as the Electronics Material Officer and Electronics Warfare Officer. “While I was aboard the Rowan, she was based in Yokosuka, Japan and executed various Vietnam combat operations including those with a carrier at Yankee Station, coastal surveillance and interdiction operations, naval gunfire strikes against targets in North Vietnam and gunline operations in the South,” said Bruce. Initially, Bruce did not intend to serve long in the Navy, but found as the end of each assignment approached, he was exposed to new and interesting opportunities which he accepted time and again. 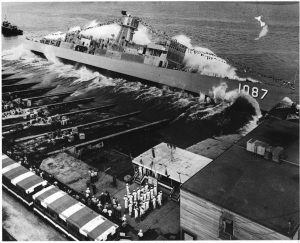 “After the Rowan and Vietnam, I was assigned to the commissioning crew for a new frigate USS Kirk (FF-1089), from launching at Pascagoula, MS through its first operational deployment,” shared Bruce. 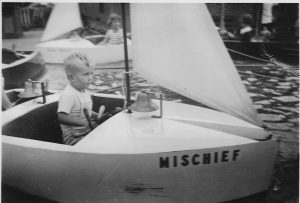 “Then I was off on a tour at sea in Europe as the US Navy representative on a multinational NATO destroyer squadron staff. After that, I went on to postgraduate school to obtain a M.S. 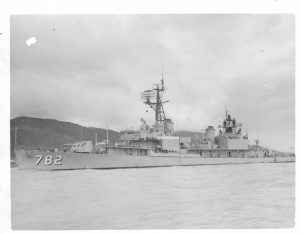 in Electrical Engineering”, then two sea tours as weapons officer on USS Jesse L Brown (FF-1089) and as chief engineer on USS Guam (LPH-9). These tours included deployments to South America, West Africa, the North Atlantic and Mediterranean. For Bruce, the Navy kept life interesting with each set of orders. However, at almost the 15-year mark, a new program in the Naval Reserve caught his interest. “In part due to the considerations of having a young family, I felt it was time for a change,” he said. This change was the Naval Reserve Engineering Duty Officer Program. “That was a perfect fit for me due to my technical education and experience from variety of shipboard tours,” said Bruce. This was also around the same time President Reagan began military expansion which included a new class of destroyers, according to Bruce. His commitment to military personnel has not waned over the years, as Bruce devouts significant amounts of personal time to volunteer with Hero’s Bridge. 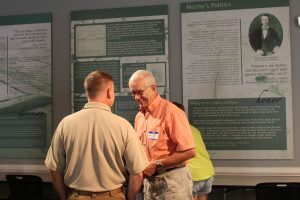 He spends hours documenting oral histories of individuals who are served by Hero’s Bridge for the Veterans History Project of the American Folklife Center at the Library of Congress. Plus, Bruce spends time each month visiting with veterans at the Villas at Suffield Meadows and is a member of Warrenton VFW Post 9835. Hero’s Bridge thanks Bruce for his years of military service and for his service to joining the mission and vision of assisting aging veterans. Hero’s Bridge respects and honors Bruce for all his has given and continues to give to this nation and those who have served.